Note: The CIM Relay Races started in 1995. So excited to be racing my 19th relay! And very excited that Anna is joining in the yearly tradition! I drive to the 2nd relay exchange. I’m taking Troy & Anna’s teammate, Kris Kennnedy, to meet Troy as he finishes the first 2 legs. Troy will then rush off and take Anna to the 3rd exchange. I’ll stay here to meet Liesbeth as she finishes Leg #2. It’s so fun to be here at the halfway way point early to see the wheelchair folks and elite runners go by! Soon I see our friend Melissa Penwell way up there in her pink socks…man, she’s flying! Here comes Troy with a smile on his face! Kris takes off and I say goodbye to my family as they leave. I told my buddy Karen Nickel that if I see her I will run a mile with her. I’m looking carefully and almost forgetting I need to be ready to go. Unfortunately I miss seeing Leonie who is waiting to pick up Liesbeth after already running the first leg. I see Liesbeth and make the exchange. I tell her great job! I take off without seeing Karen. I hope she ran by already and I just missed her. I’m feeling pumped up! The 3:33 pace group is just ahead and my neighbor Tim Twietmeyer is leading it. Mile 1 is 7:10. My high hopes for 7 min pace are probably not going to happen but got to keep it under 7:30! Mile 2 is 7:12. This is feeling harder! I realize I never stretched before I started. I get so distracted cheering on others and looking for folks, I just forget those important details sometimes! Mile 3 is 7:10. I catch the 3:33 group. “Hey Tim!” He asks me about Anna and I tell him she’s finishing the relay and her team is ahead. “I hope she beats me!”. Mile 4 is 7:24. Still under 7:30 pace but this is feeling tough. My new shoes are not great and the forefoot feels like it’s on fire! MIle 5 is 7:27. Hang in there! The hills are just enought to sap some energy. I catch the 3:28 group. I wonder if I’m gaining on Kris. Maybe I’ll get to hitch a ride with Troy to the finish! Mile 6 is 7:29. Okay, time to get serious! Let’s go! 1 More Mile!! I feel pumped again to go and I start digging deep. I got to stay under 7:30 and get this pain over with! Yeah, I see the exchange! I see Megan! We make a good exchange and she’s off! To the finish! I start walking with Megan’s family (hubby, Toney, and the kiddos) to their car. Suddenly I see Troy in the van! Great timing! I say thanks and goodbye to Toney and jump in! Off to see Anna and Megan at the finish! It’s going to be a perfect day for running. It’s always exciting being part of a relay, knowing others are counting on you. Even more exciting that my teammate, Anna, 11 years old, will get to end at the marathon finish line along with thousands of others. She’s been talking about this since last year when she watched other Relays finish. I pick up Karen, Mike, Issac and Jim and head to the start. It was the same plan as previous years but this time the 20 min bathroom wait has made the situation dire. Karen and Mike are doing the marathon and there’s only 7 min to the start! Jim is a marathon pacer and has special VIP priveleges so probably didn’t wait in any lines. It’s Mike’s first CIM so I run off with him to get him through the bag check and to the starting area. With only a minute till the start we’re still trying to make our way to the 3:10 group. I hope Karen & Isaac got a good spot. Go! It’s a really slow start with hundreds in front of us. Mike & I run together, moving slowly around others. I bump into Michael Cortez from Tuesday Night Track. 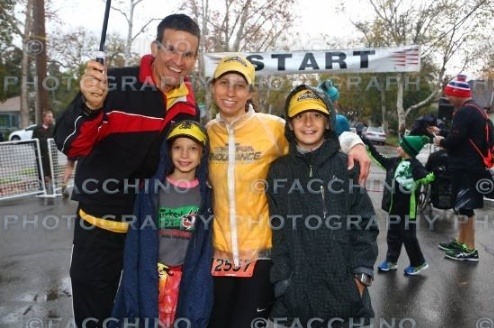 Although a 100mi ultra runner, he’s doing his first marathon! We both comment on it being crazy to find someone you know amidst thousands. Mile 1. 7:36. Turning onto Oak we get the first feel of effort on the slight climb. Our pace is slower than planned (7:00 for me, 7:15 for Mike) but Mike seems very relaxed and fine with it. I especially want his race to go well because I didn’t get him to the start early enough. I want to get us back on track but without effort so I coach Mike about the rollers, easing up them, and making up time down them. It goes well. We run near the edge of the road to get clear road ahead. Mile 2. 7:02. The road is clearing up more. I get water but Mike doesn’t. I encourage him to take some of mine. I also realize the best I can do for his race is pray for him so I ask if I can and say a quick prayer for God to give us both good races. He’s thankful and we continue on, using the downhills to our advantage. Mile 3. 6:40. We’ve passed the 3:13 pace group. We also pass a Forward Motion pack including Carrie Chavez! Great to see her and chat a little. She will surely do well. The weather is perfect. I have a base layer, arm warmers and gloves but I’m warming up quite fast and the sun is coming out. Mike sheds his long sleeve. Mile 4. 6:52. I get more water. Making sure I drink a lot because I’m going to need a big effort soon to reach my goal and water is critical for good muscle function. Spectators have been great as usual. A group of volunteer girls are trying to yell the beat of the Rocky “Eye of the Tiger” theme, very funny. Mile 6. 7:01. Another gradual downhill stretch. The road is wide and plenty of room to run smooth now. We’ve caught the 3:08 pace group. I remind Mike that we started a little behind them so he’s really ahead of them. He agrees this is a good group to stay with. I encourage him and keep saying to stay relaxed. And that I’m going to push ahead. Mile 8: 6:46. Another fast mile. I enjoy a gel and a cup of water. I think about God’s blessings and appreciate him being with me. Mile 9: 6:52. All going well. Even with some hills on this mile. I can’t wait to get to the little town at mile 10 where the H.S. band plays and I get another gel. Mile 10: 6:46. Love the town. Even feeling more tired now, I appreciate them all being out here. I eat my gel and now have to make a quick porta-potty break since I skipped using the bathroom before the start of the race. Mile 11: 6:58. Had a very fast bathroom break but still lost about 20 secs. Determined to make it up. Pushing hard! My calf feels a little tight, and the achilles acts up a little, so I take some moments to go easier before picking it up on the downhills. Mile 12: 6:50. The last long straight away. My spirits are lifted when I see the 1/2 Marathon arch. But then I realize it’s still another 1/2 mile to transition. I pick it up even more to see what I can get for a 1/2 marathon since I haven’t done one since my last marathon. Mile 13: 6:38. fastest mile yet! Great, 1:31 1/2. Now, feeling done, but gotta try to catch the 3:03 pace group before I had off to Kris. After seeing them for a couple miles, I finally pass them! Mile 13.5 I see Kris easily and he’s smiling. We have a great exchange. No stress, just happy to be doing this together. I send him off with, “May you feel the Lord’s pleasure.” I hope he has a great run. I see Chris and I get ready to run. Chris gives me a High-5 and then I take off the chip on his leg and put it on mine. I start running and I feel great and I can’t stop smiling. Mile 1. 7:23. I keep running and see an aid station. I get some water and then I keep running. Mile 2. 7:38. I run over a bridge with lots of people cheering for me and everyone else. Mile 5. 7:44. I see a Christmas tree and the finish on the other side of me and I get excited. I hear somebody call my name and I look and see my friends Ellie and Ben cheering for me. Then I turn the corner then turn again and see the finish and sprint and beat one girl while sprinting and finish. Mile 5.8. 6:54 pace. Wow. I get a space blanket, some food and take pictures with my team. That was great! I wake up at 4am and it’s go time! So many emotions going through me! I stop and take the time to read the Bible and spend time with Jesus. There is no way today will be successful without Him! I read through Romans 13 and 14. “Let no debt remain outstanding, except the continuing debt to love one another”. That reminds me of Iron Prayer a few days back. Teammate Brad Cooper was giving us Apostle Paul’s Training plan from Galatians 5:22-23: “The fruit of the Spirit is love, joy, peace, patience, kindess, goodness, faithfulness, gentleness and self-control”. 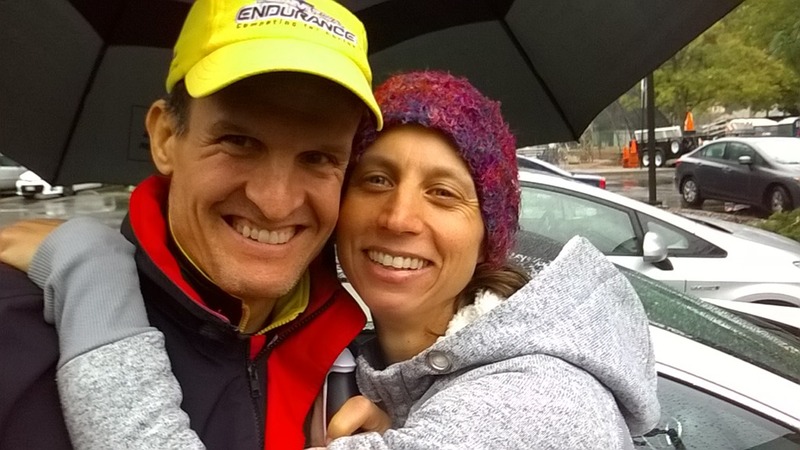 Paul’s Plan – Step #1 – LOVE: Love is the first part of the Ironman. Loving those who helped and supported you in getting to the starting line. I think back to the many months of support Troy and the girls have given me. Troy encouraging me, coaching me and taking great care of the girls while I train. The girls making meals, helping me keep the house clean and telling me I can do this. I love them so dearly and love the Lord for giving them to me! Troy drops me off at Boulder High School (T2) at 4:45am. I drop off my “Special Needs”. These are the things I can grab halfway through the bike and run. Next I add flasks to my T2 run bag. Then it’s on the bus to Boulder Reservoir. It’s a rolling start. You place yourself among others of the similar pace. There are signs to help designate different pace groups. As soon as I cross the timing mat, my race begins. This is great for minimizing the mass-start washing machine effect but it makes it very difficult to know your placing among folks in your age group. Today is also a one loop swim course! Just a big triangle. It’s been a really long time since I’ve done one of these! The yellow buoys change to orange buoys when you’re 1/2 way. Pretty straight forward! I’m also glad wetsuits are allowed. The high water temps earlier in the week threatened a no-wetsuit swim. I don’t see Troy and the girls yet. He texted that they are running over to me. I need to hand off my bag. He calls but I cannot hear him on the phone. Finally I see him. I run over and hand him my bag. The National Anthem starts. I want to finish up and get my cap and goggles on but I resist the temptation. I feel stress. Paul’s Plan – Step #2 – JOY: The Lord reminds me to be joyful and not stressed out…or fearful…I think the stress is just fear of the unknown. It always seems like a mad scramble getting to the starting line. With 2 different transistion areas, it can be hectic. The anthem ends and I say a quick prayer with Troy and the girls. I wish I had more time to talk with them! We are all waiting for the cannon to go off! A woman next to me is doing the Rosary cross gesture. When she is done, I tap her on the shoulder and say “God is with us”. She smiles. The cannon goes off! It takes a few minutes to get to the water as swimmers slowly enter the water ahead of me. I’m soon in and off! Paul’s Plan – Step #3 – Swim - PEACE: Time to settle down and swim! I get into a good rhythm. Going out is great! I feel strong and I’m passing a lot of folks. There are not many pink caps (women) but there are plenty of green caps (guys). I make it to the first turn buoy with no incidents…yeah! Soon I start to think about the affects of the altitude. Maybe I’m not breathing enough. Maybe I’m swimming too fast and am going to blow up. I think I need to take more breaths so I start breathing twice every 5 strokes instead of once every 3. My rhythm starts to break and I see swimmers passing me. I start to panic a bit. Remember, PEACE! I pray. I feel the Lord reassure me to stick to what I was doing before. You don’t need your arms for the bike and run! I settle down. I make it to the orange buoys and glance at my watch: 33 mins. That’s a min slower than expected but it’s in the range. I’m moving well and passing other swimmers. I make the last turn and it’s now the home stretch! I feel fatigue. I see a few pink caps coming up…and one ahead. Just keep pressing! It’s almost done! Let’s go arms! I also kick more. Last push and I’m touching ground. I run up the ramp pulling off the top part of my wetsuit. I run into transition where volunteers are waiting to pull off my wetsuit. I lay down and they rip it off. They help me up and I’m off to my bag of bike gear. Into the changing tent. Volunteers help me get on my socks and arm warmers. I grab my shoes and run out. Because of all the running required through transition, I’ve opted to wear socks and put on my shoes at the mount line. First there’s a 24 mile loop to the west. After that it’s 2 big loops to the North and then the finish. Mile 10. I’m averaging 20mph with a low heart rate. I start to hit some rollers and I feel some strain. Overall, I’m staying patient. Ironman has huge inflated stick-men on course pointing out the turns. It’s awesome because you can see them from really far away. There’s no way I’m getting lost! Mile 18. I skip the first aid station. I have everything I need at the moment including some water. Mile 20. I’m averaging 19.7mph. The rollers have slowed me down and increased my heart rate for moments. Overall, I’m feeling good. I’m getting passed mostly by men but a few fast girls younger than me have passed. Mile 24. I start the 1st of two loops. It starts out on Hwy 36. In most parts it’s a major freeway especially in the other direction towards Denver. After it hits Boulder, it’s just a two lane road with a bike lane. The bike lane is coned off. It starts off with plenty of room and then narrows. It looks difficult to pass or be passed here. There are not a lot of riders ahead which is great but I try to stay far right in case someone wants to go by. The road is open and cars are going through. Hwy 36 apparently has the “big hill”. Driving it yesterday, however, we didn’t notice one…especially when compared to the Flatiron Mountains hovering over Boulder. I do feel a hill but cannot see it…it reminds me of the last 10 miles of Wildflower. Four miles later we turn off and go downhlll. Weeee! I’m carrying scripture cards in my food pouch on my toptube: Rom 5:1-11, 1 Thess 5:16-18, Ps 139, Ps 37:1-7, Ps 121. Also on there, I have 4 people I’m praying for: Austin Harper (traumatic head injury), Kathy Webster (cancer), Mike Rigsby (cancer) and Sean English (cancer). These folks are doing their own personal Ironman daily. This day will not compare! I fill up my Aero bottle with water at the next aid station. I’ve already finished 1 bottle of Perpetuem. Paul’s Plan – Step #5 – Bike – KINDNESS: I thank the volunteers! I wonder if God will call me to pull over and help someone today. My natural instinct immediately thinks “not today!” Kindness, kindness Robin. We turn on Nelson Road and ride back towards Hwy 36. It looks nice and flat but I feel strain on my legs like I’m climbing a steep hill…and my speed is below 10mph at times. Another false flat! So weird! I come around a corner and see a guy sitting on a guard rail. I’m moving slowly & ask if he needs anything. He smiles, “Have a new derailleur?” while holding part of one in his hand. “I’m so sorry I cannot help!” He shrugs and smiles. What a great attitude! I pray that the bike techs will come quickly! Mile 40. I’m averaging 19. That last 5 miles was a 15mph average! I turn back on Hwy 36 and am moving fast again. There are once again cones separating cars from the bikes. This time, there is lots of room. I see a guy ahead of me. Suddently he swerves severely. He almost falls but corrects himself and rides into some dirt. He’s going down! But amazingly he stays upright! Thank you Jesus! We are really moving here so that could have been a very bad crash! 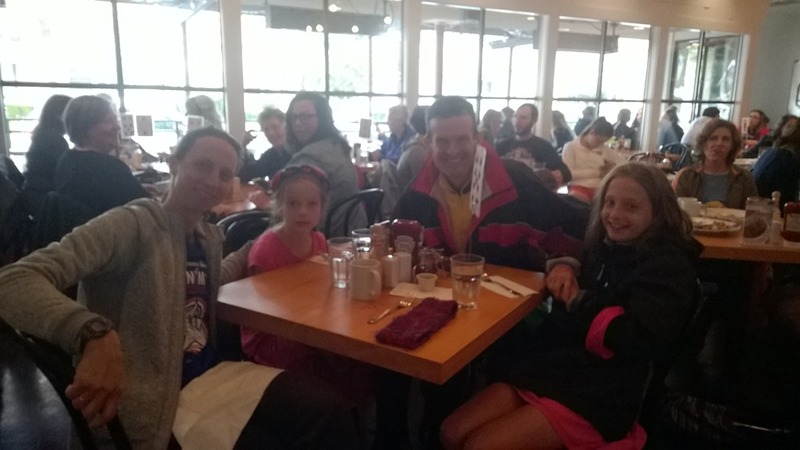 Paul’s Plan – Step #6 – Bike – GOODNESS: I’m putting good things into my body to keep fueled. I’m working on finishing off my next bottle of Perpeteum. The special needs is at Mile 60 and I can get more fuel. At Mile 50, I’m averaging over 20mph and still keeping my heart rate low. Going through the town of Hygiene now. There are so many folks here! I see some orange signs. Maybe a turn? No inflatable stickman and I’m confused for a moment. Oh, it’s a Railroad crossing! I hear a faint “left” behind me and realize I’ve drifted to the left. Oops, I move toward the right and suddenly a rider goes screaming by on the right! What?! Riders are only supposed to pass on the left. Thank you Lord I didn’t run into him and crash. Even though I was out of position, that guy took a terrible risk! Five miles down the road, it turns from rural to more developed. I see a guy ahead fixing a flat. He seems to be handling it. As I go by he looks up and shouts “do you have a CO2?” I pull over and pull out my inflator, but he comes over pointing to my cartidges screwed into their supports. I tell him to go ahead and he quickly unscrews one from my bike. He says thanks and that this is his 2nd attempt to fix this flat. I roll out thanking God. I was grateful for an opportunity to help and glad God opened the door…and it was quick, too, so I didn’t loose any time! Thanks Jesus! Mile 60. I’m at 20 mph. I turn the corner and see the Special Needs. I shout out “578” to a volunteer and see folks retrieving it ahead. As I pull my 2 Polar Water bottles (Perpeteum and Sustainined Energy) from the bag, my heart sinks because they are still frozen. I thought for sure freezing would be fine this time with the warm air temps, compared to the same thing that happened at Tahoe on a 30 degree day. Looks like I made a dumb move again! I put the bottles on my bike, grab my food, and thank the volunteers. Focus on Christ and He’ll make it work out. I’m praying and asking God for wisdom with these bottles. I grab one and am able to get a good gulp out. It’s pretty concentrated which makes my stomach cringe but I’ll take what I can get. I’ll just milk these bottles and keep putting water in my Aero bottle. Up the road from Special Needs is an Aid statiion. Thank you Jesus! I grab water. Mile 65. I start the 2nd loop! Back on Hwy 36. This time there are more bikes since some folks are starting their 1st loop. As it narrows, I’m really concerned about the passing and being passed (especially after the way I got passed on the right in Hygiene). I’ve got to be aware! I see some riders ahead in the center of the lane. I look back and see the road is clear of cars. I carefully move outside the cones to pass. I do not want to do that again and probably shouldn’t. Just as I’m processing that last thought, I see police lights flashing ahead. Oh, someone must have crashed. The police have blocked off the road and diverted traffic. They’re letting bikes go through a narrow area next to the double yellow line. I look over and see a mangled bike and blood on the ground. Oh no! Please God, don’t let this one be serious! I pray. Mile 70. I’m at 19mph. Just turned off of Hwy 36…relieved! Now time to get pumped up for that false flat section. After that, I should be able to move! I’ve been able to eek out big sips of my Perpeteum and SE. Each time I grab a bottle, I bang the bottle on my handlebars to break up the ice. The concentrated liquid coming out still turns my stomach but I know I’ve got to keep taking nutrition. I regret having Clif Bloks for the 2nd half. I’ll be eating 1 each mile of the run and don’t want to get sick of them too soon! Again, got to be patient and faithful. I see Troy and the girls again. Lots of smiles again. Troy shouts, “start thinking about the run!”. Okay, one last time on Nelson Rd. I make the turn and am ready for the “hill”. Back to Hwy 36! Time to get that average back up! Mile 90. I get my average back close to 20mph. I really love this bike course! Just when you loose speed, you find a spot to get it back. It helps me keep my head in the game! Back through the town of Hygiene. This time I keep to the right! A girl goes by and I see only a 4 on her calf. Is she in my age group? She slows down. This is a bummer. Once someone passes you, you have to drop back 6 bike lengths. When a fast rider goes by it’s not a big deal but when someone slows down, I have to also. I drop back and pass again down the road. After a few more times of this, I put in a surge in effort. I see Troy and the girls once again…smiling big! Next time I see them, I’ll be on the run! Around the corner is Mile 100!! Mile 100. I’m averaging a bit under 20mph. I feel confident that I can keep myself well above my goal of 18.7 to the end. This is going to be a PR pace! Thank you Lord! I’m headed back to town. Mile 106. I finally get to go straight and skip the loops! Yeah! I know this part of the course well since I’ve been riding it leading up to today. I just have 3 more miles! Get ready for the run! I’m feeling a bit anxious going into it. Will I feel good? Will I meet my 4 hr goal? Lord, I put it in your hands! I see the high school. I’ll be dismounting soon. I am able to pull my feet out of my bike shoes and put them on top of my shoes. I pedal in and dismount. My dismount is smooth but my legs do not feel as good. It’s a long run to the track and then the changing tents. As I get to my bag, the girl I was going back-n-forth with on the bike goes by. She was right behind me! Two volunteers follow me into the tent and help me get ready. This is A-class service for sure…awesome! On the way out, I stop at the porta. Okay, let’s do this! Paul’s Plan – Step #8 – Run – GENTLENESS: Ease into the run and let the legs adjust. My legs are not feeling great at all but I’m hoping that will change. This first 6 miles or so are slightly down. My goal is to run 8:45 pace downhill and 9:00 pace on the uphills. Paul’s Plan – Step #9 – Run – SELF-CONTROL: Stick to the plan. Don’t go too fast when you feel good because it’s a long day. And don’t slack on nutrtion. Mile 1 is 8:41. Good. I’m trying to finish my flask of Heed. I was supposed to chug it in transition. Mile 2 is 8:41. I turn off for the first out and back. Surprised I’m keeping the pace because my legs feel horrible! Making myself eat a Clif Blok. It’s supposed to be one every mile but not feeling so great. I feel like I might need another porta potty break. Maybe it will just go away. Mile 3 is 8:51. Thanks God for letting me keep this pace. It’s not feeling great. 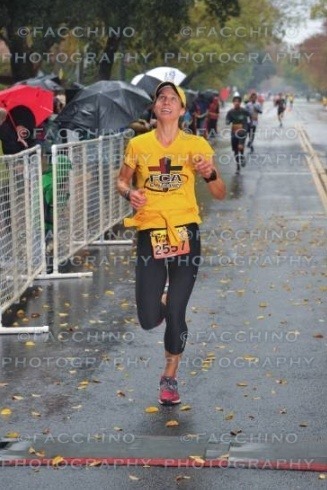 I think back to how energized I was at Vineman 70.3 at this point in the race…I was talking to others and smiling so easily. 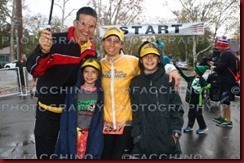 I knew that the marathon was going to be hard but not from the very beginning. I make it to the turn around. On my way back I see teammates Mitch Kusick and Rich Kiser. For God’s glory! Mile 4 is 8:47. I sip on another flask. It just doesn’t appeal to me but I know I need to do it. Mile 5 is 8:52. There is our friend Kat D’Angelo, Troy and the girls! I’m so happy to see them and I smile but it’s really hard to do. Troy tells me to “just enjoy it”. That must mean I’m out of the running for a slot. Well, I’m going to try keeping this pace as long as possible. Heading out on the other out and back (the course is like a Y). Mile 6 is 8:52. Wow, it’s HOT on this stretch! There is zero shade. Most of the course is well shaded, which, compared to most other Ironmans I’ve done, is unusual. I will try not to complain. I see Mitch’s mom, Becky, cheering and holding a sign…”press on!”. I saw her several times on the bike and here she is again! So great! Mile 7 is 9:06. Heading back now. I again see Mitch and Rich. I’m trying to eat a Clif Blok every mile now. Still sipping my 2nd flask and I really should be on my 4th by now. This is not the plan but it is SO unappealing. I try to drink some sips of water at each aid station. I don’t want hyponatremia (too much water) either so I only take a bit. I decide to make the porta break but it doesn’t alleviate the problem. Mile 8 is 10:25. I’m climbing back now. I want to walk so much but I know I cannot. I see Anna ahead. She plays my requested song for this race: “It’s Not Over Yet” by King & Country. Right, it’s not over yet. I force a smile and thank her. There is Troy. He says, “if you want to jump in the creek to cool off, go for it”. Man, I really must be out of the running. I got to keep running. MIle 9 is 9:31. Now It’s back to where I began along the creek and then beyond. Mile 10 is 9:44. I see Special Needs. I haven’t finished the stuff I’m carrying so I won’t stop. I will pass by here around 13. I’ll wait. I see teammate, Matt Smith. I smile and wave. He’s a coach and I wonder if I should ask his advice on drinking more or less. My porta issue is still lingering and I’m concerned. I also see that girl from the bike. She’s looking strong! Might be one of those top 3 in my age group. Mile 11 is 10:05. This is a beautiful section of the course but also the steepest. I can see families in the creek floating on their innertubes. Oh, I would like to be there. Keep going! Mile 12 is 10:54. And I’m at the top of the course. I’m forcing the Bloks but have almost given up on my flasks. Coming down my right big toe just keeps sliding forward and banging on the end of my shoe. This is going to give me a black toe for sure! Now I have a second reason to stop at the porta to fix this. At the next aid station, I hit the porta and fix my issues…it helps some but something still isn’t right.. and I hope it isn’t serious. I’m concerned about what to drink. I grab a Coke now, instead of mile 20, thinking that it will help my tummy. When I see Matt, I tell him my concerns. He tells me “not to worry about it until the end”. Probably a good idea not to stress. I stop at Special Needs and grab 2 more flasks. I don’t want them but it wouldn’t be smart not to. I grab a few more Bloks and a gel. I was carrying 12 bloks and now am down to 5…so I grab another 3. Don’t want those either. Mile 13 is 11:58. Slowest split yet! My heart rate hasn’t gotten over 140 which means I could be pushing harder..but I don’t feel like it. I see Jason Ford along with Rich! Mile 14 is 10:54. I’m continuing to sip water and Coke at aid stations. I’m eating oranges now too. Ice in the hat and water on the head! Mile 15 is 10:36. Out and back time! I see Troy and he tells me I’m still in 6th…but 7th is gaining on me and 5th is pulling away. “Pick it up!”. That’s good news that I’m holding my position. I don’t want to get beat by 7th so I start to push and my body responds! I still feel uncomfortable but doing better than expected. I feel like the porta issue is gone too…praise God! I run to the girls to give high 5s. Mile 16 is 9:51. Alright, I’m moving more! I’m continuing to force the Bloks and oranges down. More sips of water and Coke. Mile 17 is 9:41. Running better even with the discomfort. Heading back to Troy and the girls. I see Mitch, Rich and Jason! Cool! Mile 18 is 9:43. Keep going! I see Troy again, then Kat and the girls. He tells me I’m still holding off 7th. Yes! MIle 19 is 9:17. I see Becky again and it’s a great boost before I head into the sun. The sun is more intense then before. Lord, help me! Mile 20 is 9:32. Heading back now…phew! I see Mitch, Rich and Jason. We are all so close! Mile 21 is 9:58. Ugh! Finally the aid station and beyon that shade! I walk through the aid station to get a pack of Bloks, water, oranges and Coke. Becky is there telling me great job. Time to move! I make it back! I’m done with these 2 out and backs. Yeah! Anna is there again with the same song. It’s not over yet!! Troy tells me to keep going strong! Mile 22 is 10:43. Climbing back to the high school and past the finish. 4 Miles should seem short but it seems so far away as I think of the terrian I need to cover! I see that gal heading back to the finish! Wow, she just seems to get faster! There is our friends Beth and Sean cheering! I wave and smile! Mile 23 is 10:25. More sips of water and Coke…another Blok. Not moving very fast…gutting it out though. There is Matt again. I smile and give him a thumbs up. I am suffering but in a much better place now. Thanks God! Mile 24 is 10:35. Almost to the top. I see our friend Sam Louie sitting on a bench. “Cramps”, he says with a smile. 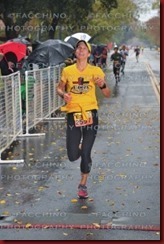 He just completed IM Vineman last weekend! What a guy! Still has a big smile! The top! Not much further now!! Mile 25 is 10:39. I can hear Mike Reilly. So close! Mile 26 is 9:56. I’m home free. My watch hits 26.2 but still no finish line. Keep moving! Finally, I”m off the bike path and heading to the finish! So relieved. I turn the corner and there is the finish! I give a bunch of high fives on the way. I point and look up to God! To Your glory God! Later that night, I find out that a cyclist was killed in that spot I passed on Hwy 36. The next day we learn she swerved outside fo the cones.